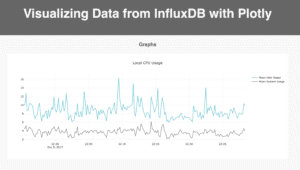 Before we start visualizing, we need to set up an instance of InfluxDB on our local machines. If you don't have the TICK Stack set up and running yet, it's best to go through the most recent Getting Started guide on the InfluxData website, which will walk you through installing and running all four packages of the stack. Or if you would prefer, you can experiment in sandbox mode. Once you're all set up, and InfluxDB is running, you can set up a file to query the database and grab some data. I'm going to do this with Node/Express using the Node-influx client library. For this example, I'll be querying for data that Telegraf is already collecting for my computer. If you have the full TICK Stack installed and running, you should be able to do the same. Here, I'm adding appropriate middleware to parse our responses (body-parser), setting the port to 3000, and defining the path which will serve up my index.html file. I use getMeasurements() to check what measurements are tracked in the database and set up the server to listen on port 3000. The last section of code queries the database for data, specifically, the mean CPU usage of user and system. Aside from incorporating JQuery and your script file, you'll need to incorporate the plotly CDN. Alternatively, you can install the plotly.js library as an npm module. For more information on that, please visit the Getting Started guide on the plotly.js website. And voila! You've got yourself a custom time series visualization using InfluxDB and plotly.js! You can check out the source code on GitHub here. Published at DZone with permission of Margo Schaedel , DZone MVB. See the original article here.